It's Inspiration Week over at the Little Miss Muffet Stamps blog but first let me fill you in on some happenings....right now over at the Little Miss Muffet Stamps shop you can find rubber stamps for 20% and 50% off! 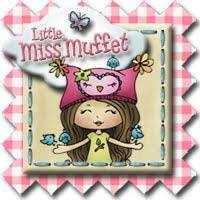 Until Sept.15 all Little Miss Muffet brand stamps are 50% off and all non- LMMS products are 20% off! All discounts are applied at check out so you don't have to worry about a coupon code. Head on over to the store HERE to take advantage of this great sale! While you are over there grab a digital freebie called School Elf Pencil, perfect for your back to school cards! 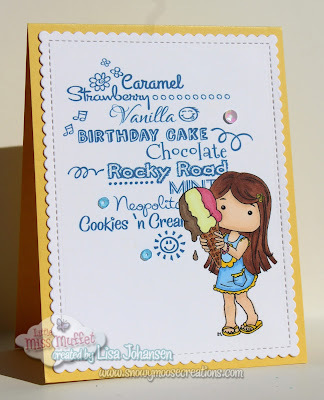 My card today also features another fun deal.....the images on my card are only available by visiting the Simply Cards and Papercraft magazine online HERE. While these ice cream images won't be available on the LMMS site for a few more months you can still find lots of great Polka Dot images in the store HERE. Don't forget, the LMMS Anything Goes challenge is still open so get your creations in!